In many ancient cultures, spiky plants known as thistles are a symbol for protection and respect. But there is much more to these weeds than just prickly barbs. Milk thistle in particular has been used by doctors for at least 2,000 years as a remedy for protecting, unblocking, and rejuvenating the liver. In the 1960s, German scientists identified a group of flavonoids in milk thistle known as silymarin—which is regarded as the active ingredient for its liver healing abilities. Silymarin is found in greatest concentration in the seeds, which are harvested in late summer to early fall, just before they mature. Herbalists both ancient and modern recommend milk thistle for liver problems. Germany’s Commission E, the government agency that evaluates medicinal plants, approves standardized milk thistle seed extract for chronic inflammatory liver disease and cirrhosis of the liver. But you don’t need extreme liver problems to benefit from milk thistle. Everyone’s liver can use a little help now and then. The liver serves as our body’s filter, sifting out poisons, excess hormones, and other impurities from our blood. The liver also produces bile to help us digest fats and proteins. When this organ gets clogged, a variety of illnesses can result: such as headaches, menstrual problems, systemic inflammation, hemorrhoids, varicose veins, and digestive issues. These are just some of the ailments people use milk thistle to treat. To ancient doctors, indications for liver problems extend beyond the physical body into the realm of the mind and spirit. In traditional Chinese medicine, for example, the liver and gallbladder are responsible for the free flow of qi (energy) throughout the body. According to this system, stagnant liver qi often manifests as anger, frustration, and depression. Milk thistle has several features that make it particularly liver friendly. This antioxidant rich herb has been shown to regenerate liver cells, strengthen cell walls in the liver, reduce inflammation in the liver and gallbladder, and dissolve gallstones so that bile can flow freely. Silymarin has also been shown to increase production of glutathione, an amino acid complex that helps the body with numerous processes and protects cells against toxins. Given milk thistle’s liver protecting prowess, some people take the herb daily as a way to guard against environmental toxins, such as pesticides, car exhaust, and cleaning chemicals. Because alcohol abuse is notoriously hard on the liver, it’s easy to see why milk thistle is often recommended to those who drink too much. Studies on silymarin have shown significant improvement in liver function for those suffering from mild alcohol related liver disease, but it has proved less effective for advanced cases. 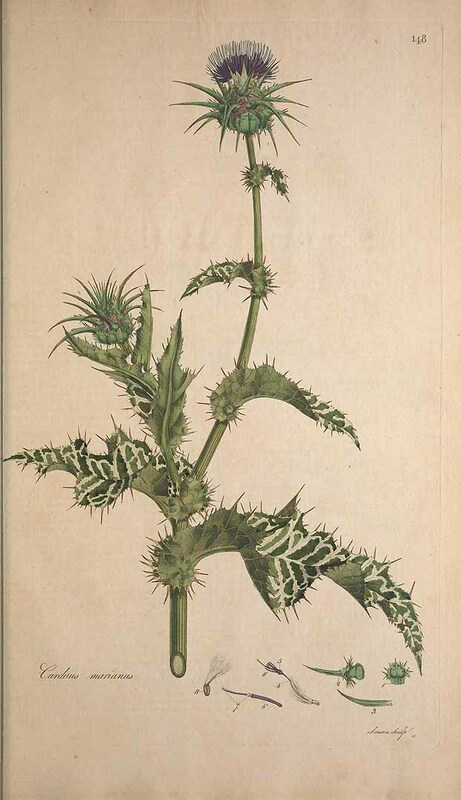 In ancient Europe, milk thistle was promoted as an antidote to snake venom and other poisons. For those who only occasionally indulge, milk thistle extract can help avoid a hangover. In ancient Europe, milk thistle was promoted as an antidote to snake venom and other poisons. Today, a growing number of doctors believe that silymarin may offer the best protection against the potentially lethal death cap mushroom (Amanita phalloides) and other highly toxic mushroom varieties. In 2011, four cases of death cap mushroom poisoning were treated at Georgetown University Hospital using a milk thistle-based injectable drug known as silibinin. All patients demonstrated a full recovery. Researchers believe that milk thistle works by blocking toxins from entering the liver cells or removing them from the cell before they cause damage. 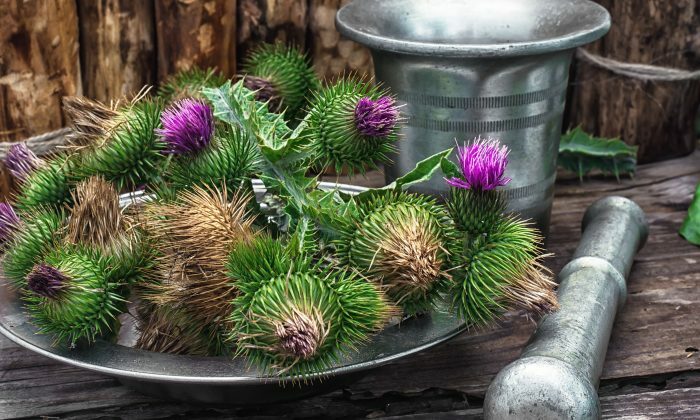 Silymarin and other milk thistle-based phytochemicals have shown promise in preliminary studies to guard against certain types of cancers, such as those of the skin, tongue, bladder, prostate, colon, and small intestine. According to the National Cancer Institute, research on milk thistle shows the herb has the potential to make chemotherapy less toxic and more effective, slow the growth of cancer cells, and help repair liver tissue. In Germany, where most of the research has been performed, doctors recommend using milk thistle extracts that are standardized to 80 percent silymarin. Since silymarin is not water soluble, a milk thistle tea won’t supply any of this complex, but there are other valuable constituents in this herb that water can extract. Contact a qualified herbalist to see how much and how best to use this herb for your particular condition. For everyday liver protection, however, just follow the dose on the bottle. You can take milk thistle alone, or combined in a formula with dandelion, fennel, bupleurum, turmeric, or other herbs with a reputation for liver cleansing. Another way to take milk thistle is to eat it. This herb has been a source of food in parts of Europe for hundreds of years. Leaves trimmed of their prickles are a nutritious green vegetable. The root can be roasted or boiled. The seeds can be brewed to make a coffee-like beverage. The stem is reportedly superior to the finest cabbage, and the immature flower head, which looks just like a small artichoke, can be consumed in a similar fashion.